Check out Wisconsin’s Bike Federation blog post from Yesterday. Buy-cycle Wisconsin this holiday season! Also if you are in the Milwaukee area, Sunday December 2nd, don’t forget to swing by their 5th annual bike swap. 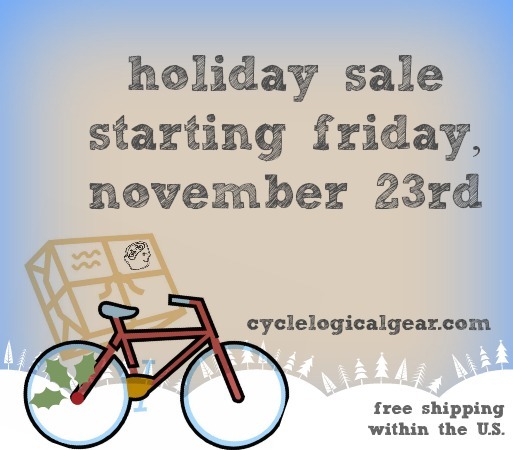 Categories: bicycle, bike, commuting, commuting gear, cool products, Cyclelogical, cycling, Events, holiday | Tags: bicycle, bike swap, Cyclelogical, cycling, gifts, Holidays, Made in Wisconsin, shop local, wisconsin, Wisconsin Bicycle Federation | Permalink. Categories: bicycle, bike, commuting, commuting gear, cool products, Cyclelogical, cycling, Events, family, family life, holiday, Inspiration | Tags: gifts | Permalink.